Take two things to El Pastor: a mobile phone and a list of local bars. 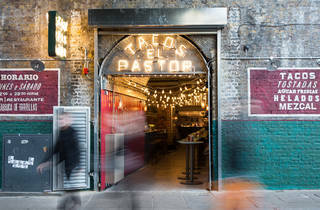 This taco joint in a railway arch next to Borough Market doesn’t accept bookings and the wait can, at peak times, be up to two hours. But at least there’s no standing in the rain: they take your number and will text when your table is ready. So why all the fuss? 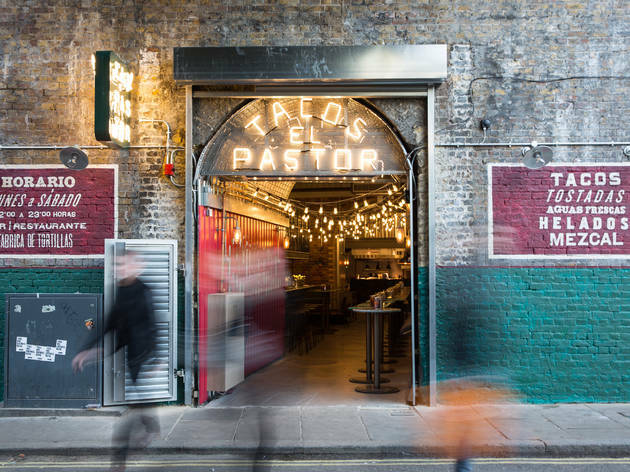 Well, El Pastor comes from the Hart Brothers (Sam and Eddie, of Barrafina fame, plus, for the first time, little bro James) alongside ex A&R man Crispin Somerville: he and Sam were mates at Manchester Uni, and they later ran a Mexico City restaurant and club together. And, my oh my, do these guys know how to throw a fiesta. The excellent, Latin-vibey music is cranked up loud; staff are smiley and obliging; the lighting is set to ‘looking good, baby’. This is a place to go when you need cheering up. Like when you’ve just been downsized, or realised you’ve forgotten to record ‘Sherlock’. It was also one of those rare meals which actually got better as it went along. To kick off, a tuna tostada, a bowl of fresh guac and a prawn taco all had the same issue: too much salt. 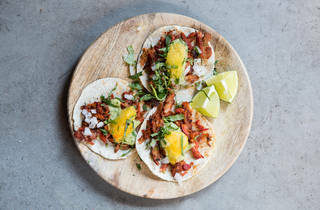 But other tacos – all on the same nicely firm corn tortillas – made me smile, starting with the strip of stonebass (good), the juicy chunks of chargrilled chicken (better) and the signature 24-hour marinated ‘al pastor’ pork (best of the lot). That said, if it’s the pastor pork you’re after, do get the ‘gringa’ quesadilla. 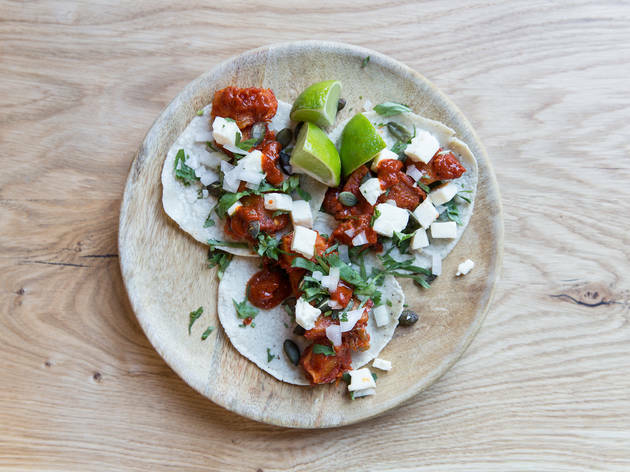 A quarter slice of a large tortilla, it’s served ‘open-faced’, with a messy tumble of meat, melted cheese, coriander and salsa. Every bite brings sweet, salt, fire, squidge and crunch. It’s dirty. It’s delicious. 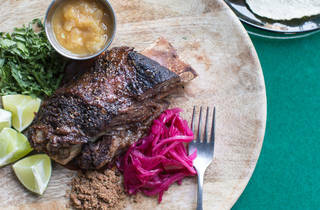 And save space for the ‘DIY’ beef short rib, too. One of only two large plates on the menu, it will easily feed two as a main. What you get is a big hunk of flesh that officially arrives on the bone, though if you so much as suggestively wave your fork in its direction, the moist, tender meat instantly shouts ‘Geronimo!’ and leaps away. 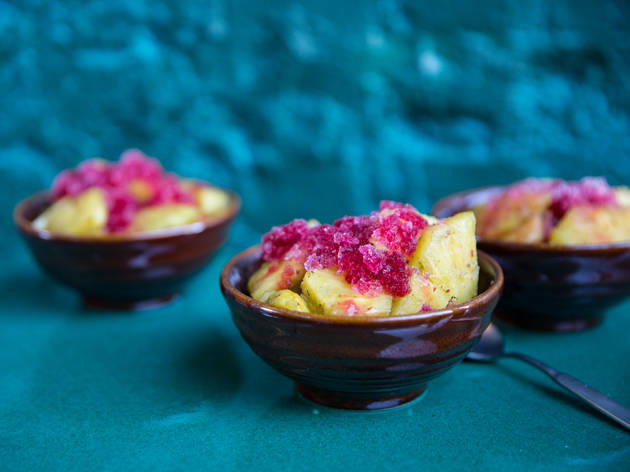 Around it are little piles: a smooth, intense sauce of roasted garlic and mild chillis, lime wedges, slivers of pickled onion, a spiced salt for sprinkling. The pot of salsa is pineapple and habanero. Finally, there’s a steamer of tacos. It’s like a Mexican crispy duck with pancakes. 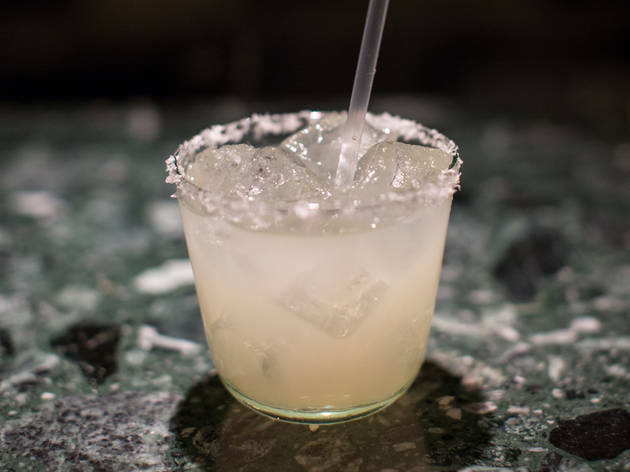 El P can be summed up by its frozen margaritas: full of Latin spirit and sure to make you happy. Luckily for the El Pastor lot they seem to have near enough hit the nail on the head with the vast majority of their menu. 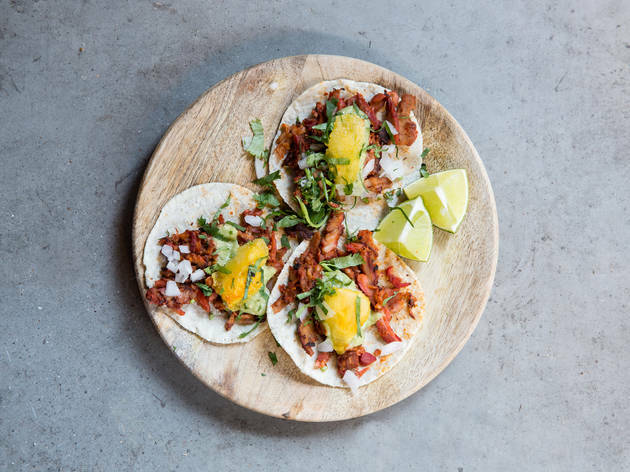 Their layering of hand-pressed, soft corn tortillas, griddled or braised fillings and fresh salsas is exactly the kind of parcel you can't wait to scoop up, scoff and struggle not to spill all down your front. Pair with a cup of frozen margarita for optimum zing. I wish I could speak as highly about the service but truth be told I had more fun at Tortilleria, their sister branch on Stanworth St, where the short menu focusses exclusively on tacos. Ordering and then collecting at the bar means you can reliably satisfy all cravings as and when they strike and then make a quick exit for mas cervezas once done. Overrated and a bit pretentious. Arrived 10 minutes before my partner at 5.30 pm (really early) and was told to wait at the bar as it was the company policy not to seat anyone until the full party had arrived. This was acceptable if the rule applied to everyone. Once my partner arrived, they seated us near the door and it was cold so I asked if we could sit in the corner. I was told this was not possible as it was a table for 4. Fine I thought and we sat in the middle of the room on the end of a table of 8. While at our table I noticed a woman was seated at the table we wanted and she was alone waiting for her other company which was one man. She waited there on her own (in a table of 4) for 10 minutes. It was early and not crowded and they could have accommodated us. The food was ok but nothing special and was pricey for what it was. Won't be going back. Slow, fussy and pricey. Paying extra for hot sauce is a joke. Nice michelada though. Never been back since the first time and it’s on the doorstep of my work - it just doesn’t add up. Shame, I love Mexican. Really amazing and gluten free friendly food. The portions are quite small, but definitely worth a try! Massive mezcal menu, just what a good Mexican places should have. They don't accept reservations, so be prepared to wait at least 30 min. I have lived on the Texas-Mexico border and have been to Mexico a half dozen times. These are damn good tacos full of flavour. But yes they are small. And the service where we sat outside was terrible so I likely wouldn't return here. For starters I am still scratching my head at the free sauces they plunk down on the table... with no chips or tortillas to go with it. Why not wait to give the sauces once food is actually put on the table?? The waitress had given my friend who got there before me water... but didn't give an extra glass for me. We also didn't get cutlery initially . I ordered the pescado and shrimp tacos tacos. I asked for the blue corn tortillas (vs white corn) as I was excited to see them on the menu. She said the "chef decides which to pick as he knows the flavours best coming from Mexico." Uh, I know which tortillas I want, thanks. Thankfully my dishes did have blue corn tortillas. Yay! And I found them delicious with the right amount of kick, especially the pescado. I also ordered the butternut squash quesadilla which is the smallest quesadilla I have ever seen but still lovely with chunks of squash bursting out. Honestly all three dishes satisfied me rather than left me bloated, which is a good thing. My friend ordered the salad, which was on the medium side, and chicken taco and was quite pleased herself. Our food came quickly which was a plus. But with service like this I'll go elsewhere. Can’t beat tacos over a few beers, although, given that there are already so many (great) options, we weren’t quite sure this place makes it high enough on the list. The menu here has a good variety and has all the dishes as you would expect. The favourite of the night was the short rib tacos; which were definitely fall off the bone and delicious. The Al Pastór taco was also good with a nice balance of chilli, zest and sweetness. The other tacos were as expected; however we found that the tortillas were a little on the smaller side and the quesadilla was more like an open quesadilla and very small in size. Overall, if you consider the price to portion and quality ratio, I can’t say that this place blew me away and I would opt for other establishments for tacos; especially if you want to leave with a well satisfied stomach. Tip: get in early for a seat inside as it can get a bit nippy outside in the recent unpredictable London springtime weather so they could use some heaters out there. The taco sizes are on the smaller side, so you will have to order around 3-4 tacos each depending on how hungry you are. 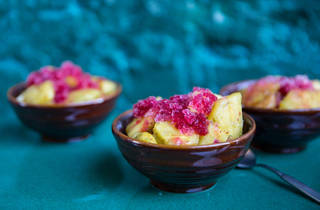 Good For: catch up with friends, small groups, casual date, casual lunch/dinner, light nibbles. I was incredibly excited to visit El Pastor after reading reviews in Timeout and elsewhere. 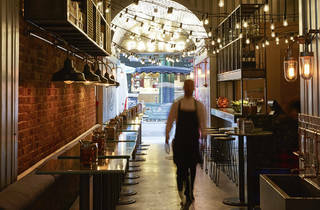 The restaurant is very attractive, right next to Borough Market, tucked under the old railways. The decor is quite cool and colourful, the seating rather tight. We sat outside as it wasn't too cold. On a warmer day, this would be ideal. However, the knocking over of glasses which smashed on the concrete outside (happened to two different parties on our visit) wasn't great. Deceptively, when you see the menu you're like 'WOW! The prices are great!' Then you realize it's £2.50 for one small soft taco. No rice, beans or guacamole to compliment either. It's going to take a lot to fill you up, if you're feeling very hungry. That being the said, the food is pretty fantastic. The prawn and pescado tacos were the best. The pastor and carnitas were a touch disappointing. 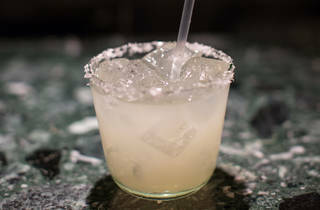 Drinks-wise, I'm just not a fan of Mexican restaurants that do margaritas in tiny, cup-sized glasses. I'm a Mexican-American from California, and when we do margaritas, they come in large, correctly shaped glasses with enough tequila to taste, and juice. Enjoyed my visit overall and would go again, but wouldn't make this a regular haunt. Cool little Mexican eatery Inside a railway arch in Borough Market. Small plates and some larger to share but the portions are definitely on the small side, so if you are starving you may end up spending a lot to get full! A bowl of guacamole and a hand full of nachos is £6 - so a tad on the expensive side. But It was a great guac! Nice fresh cocktails and a great line up of mezcals. Bustling area with lots going on, people just hanging out for drinks as well as eating so not a particularly relaxed vibe. This restaurant shows great promise - the decor and atmosphere is great and the food and cocktails are delicious. However what let this place down was its confusing menu (printed on pink paper which meant several diners around me had to use their phone torch to see it) and their bizarre portions. It wasn't clear how much food we should order and the portion sizes were small. 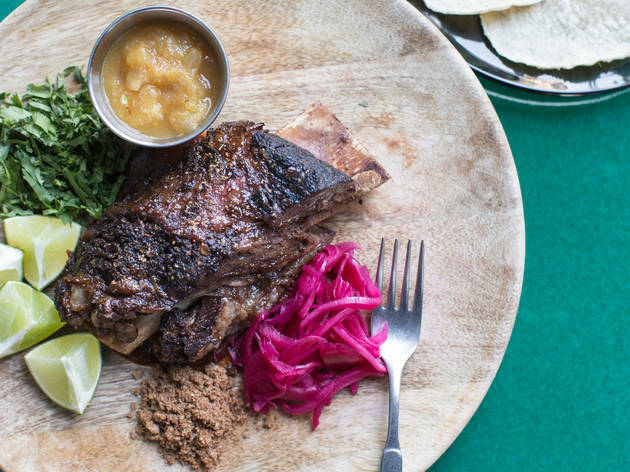 We ordered a beef rib which should serve two-three people but it only came with 5 tacos and after asking for more we were charged £1 for each extra taco. We also had an issue where we were given the wrong food as our waiter got confused about our order. If the service and menu improve this will be a new gem for Borough Market. Great Mexican food - small and large plates to share and cocktails with a house twist. 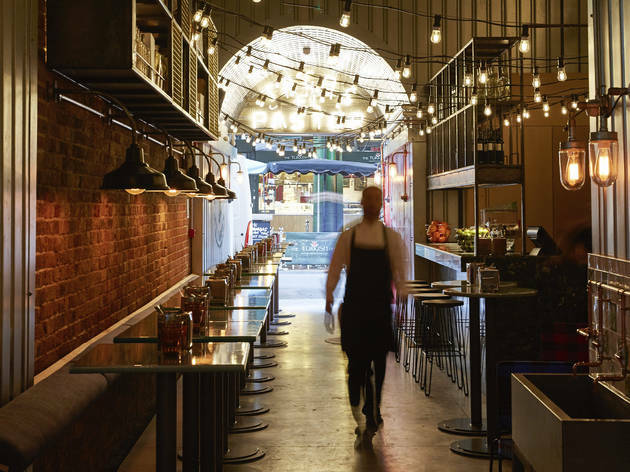 Trendy venue with its restaurant front opening right onto the hustle and bustle of Borough Market and the London Bridge night life. 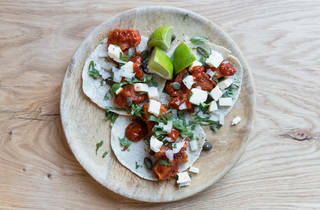 Try the spicy salmon tacos and the short rib beef tortillas. They've got a decent Mezcal menu too which shouldn't be missed, especially if it's a first time trying one ...helpful staff on hand to advise the novice Mezcal-buyer what's what. Get them served up with orange slices and chilli salt.